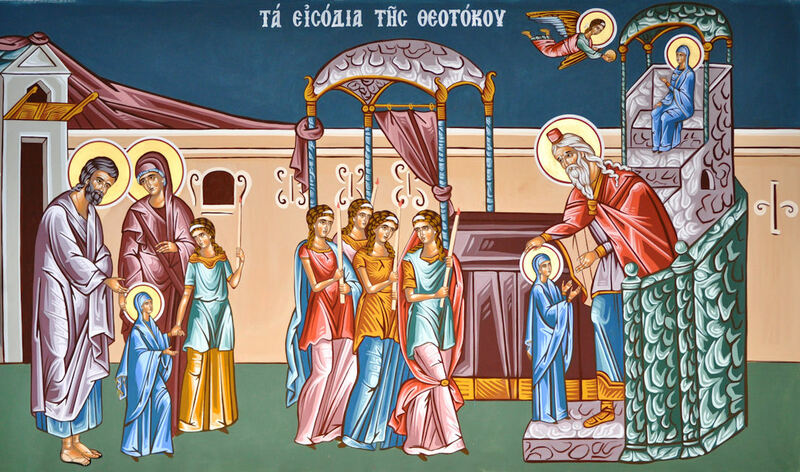 Come, all ye Faithful who love the Theotokos! Let us celebrate once again in a godly manner. Let us light the torches of chastity in Christ; let us cense with the fragrant incense of Divine love; let us raise up our minds with heavenly thoughts; let us bring peace to our hearts with the Grace of the Mother of God, distributing these things with righteousness to the three faculties of our souls. How could it be possible for her children to become negligent and slothful, now that she brings forth the Light of Grace? Now that the shadow of the symbols of the Law is receding? And while the Sun of Righteousness, Christ, will soon rise? The following particularly striking narrative underscores this truth and bolsters us to take refuge, with faith and hope, in the love for mankind of the All-Holy Theotokos. “I had a disciple who, unbeknownst to me, fell into various sins. It so happened that he died. I prayed at length to God and besought the Holy Theotokos to reveal to me in whose company his soul was to be found after its departure from his body. “When I had awoken from the ecstasy, I began to be exceedingly sorrowful and anxious. I gave alms, according to my ability, for the repose of his soul and had him commemorated at Divine Liturgies. I besought the Holy Theotokos to have mercy on him. I also besought God, Who loves mankind, on his account. And even though I had reached such deep old age, I began to toil in asceticism and eat only uncooked foods. 2. 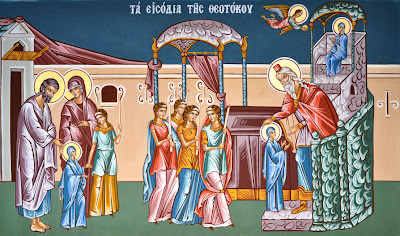 Kontakion for the Entrance of the Theotokos. 3. St. Andrew of Crete, Patrologia Græca, Vol. XCVII, col. 817D. 6. St. Nikodemos the Hagiorite, Κῆπος Χαρίτων [Garden of Graces] (Thessaloniki: Ekdoseis B. Regopoulou, 1979), pp. 195a, 196a. 7. St. Andrew of Crete, Patrologia Græca, Vol. XCVII, col. 876A. 8. St. Gregory Palamas, “Homily LIII,” §§ 51, 59, Ἑλληνες Πατέρες τῆς Ἐκκλησίας, Vol. XI (Thessaloniki: Paterikai Ekdoseis Gregorios Ho Palamas, 1986). 10. St. Nikodemos the Hagiorite, Κῆπος Χαρίτων, pp. 195b-196a, 215b.11. Idem, Ἀόρατος Πόλεμος [Unseen Warfare], Part I, §49 (Athens: Ekdoseis “Phos,” 1977), p. 176. 12. Τὸ Μέγα Γεροντικόν [The Great Gerontikon], Vol. IV, ch. 18, §32 (Panorama, Thessaloniki: Ekdosis Hierou Hesychasteriou to Genesion tes Theotokou, 1999), pp. 348-351.